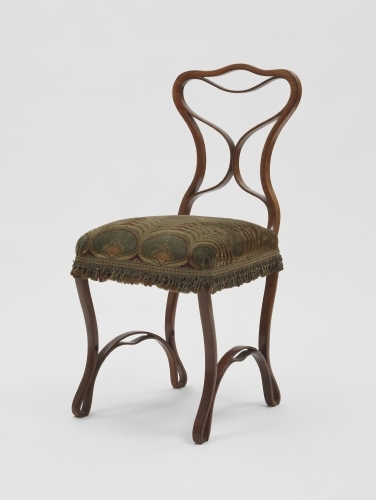 When one thinks “bentwood furniture,” the name Michael Thonet usually comes to mind first. But, that is only because he made the technique his signature—practically his only until well into the 20th century—style. Samuel Gragg beat him to it about thirty years earlier. 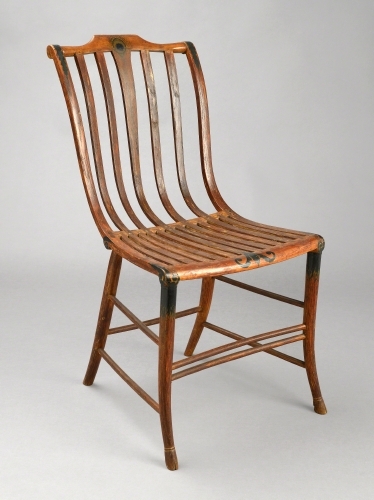 On August 31, 1808 Gragg applied for a Federal patent on his “Elastic Chair.” The chair was inspired by the ancient Greek “klismos” chair, but Gragg’s design was lighter and more flexible. Gragg produced both armchairs and side chairs in the style. One settee in the bentwood process has survived. 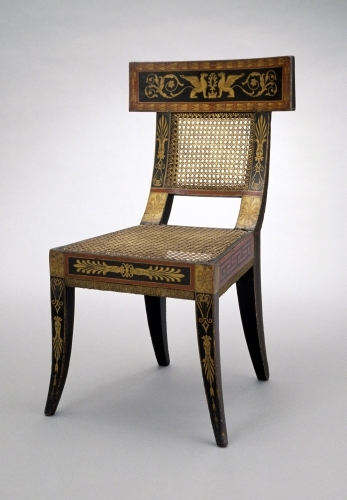 He finished his chairs with “fancy” or “fantasy” painted decoration (cheaper than carving) of peacock feathers and acanthus leaves, both classical motifs. The front legs end in “goat-hoof” feet, a decorative element from ancient Greek and Egyptian furniture. If one was being a picky art historian, one could give these chairs stylistic designations such as Greek Revival or Federal Style, but Gragg them called “Elastic” because they gently gave with the sitter. The period immediately following the Revolution (1776-1783) was one in which both Greek and Roman classicism affected all major artforms, including furniture design. The most elegant feature of Gragg’s chair is the fact that the seat back stiles (the vertical framing members of the back) are one piece with the side rails of the seat. To achieve strength and flexibility in these elegant curves, Gragg split rather than sawed the wood so that the grain was parallel with the shape of the chair part. It was truly an early example of American innovation, and one of the most landmark events in American furniture history. Gragg was born the son of a wheel maker in New Hampshire. From 1801 until his death he made furniture, primarily seating, in Boston. Although Gragg’s trade cards advertised “Patent chairs and settees” referring to the Elastic Chair, he knew of the Boston clientele’s diverse tastes and produced chairs in a number of fashionable revival styles, including Gothic Revival and Renaissance Revival. There were many versions of the ancient Greek “klismos,” although, unlike Gragg’s chair, they were carved rather than built of bent wood members. This elegant example by Latrobe, one of the architects of the US Capitol in Washington, DC, has a heavier feel to it than Gragg’s chair. It contains the painted decoration of classical motifs, such as acanthus and confronting chimera, on the back crest rail. It has more the feel of the solid geometry of Neoclassical architecture, rather than the light, positive-and-negative space of Gragg’s. Most people in the early United States could not afford to buy complete sets of furniture for every room in their house. Side chairs were often carried from one room to another during get-togethers, making Gragg’s light chair infinitely more useful than Latrobe’s. Click here to see the bentwood process used by Gragg step by step.